And now for a study in contrasts. If last week’s UK Home Office flight records submitted their data to a partial lockdown, i.e., by apparently boarding up their flight destination data, the data before us now – combed from the US Research and Innovative Technology Administration Bureau of Transportation Statistics (RITA) – suffers from no such recalcitrance. Again, be advised that the capture above is rather fractional; there’s far more there in there, although you’re likely decide against many of the downloadable fields, e.g. the long block of Diverted Airport Information parameters. On the other hand, as they used to say about the New York Times, it’s nice to know it’s all there. (Note that because I’ve initially filtered the data for October, 2013, there’s no need to actually interject those fields into the download). Of course, with all those other boxes you can customize and re-customize your investigations to your heart’s content, and handy lookup tables explicate the content of many fields whose data are guised in coded terms. Noteworthy day-of-week variation obtains, as we see, with Tuesdays and Wednesdays more or less equivalently busy, and with Mondays at their heels. I would have expected far denser, weekend-presaging Friday flight activity, on the other hand, but that just goes to show you what I know. Here New York state reports itself as a destination 24,905 times, or 51.5% of all arrivals. 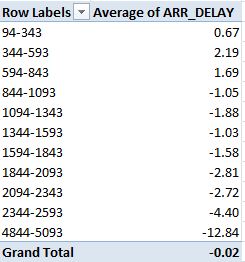 Remember of course that all the flights among the data either took off or touched down in New York – but because some flights embarked from and landed in New York, the state’s departure/arrival numbers aren’t quite reciprocal. 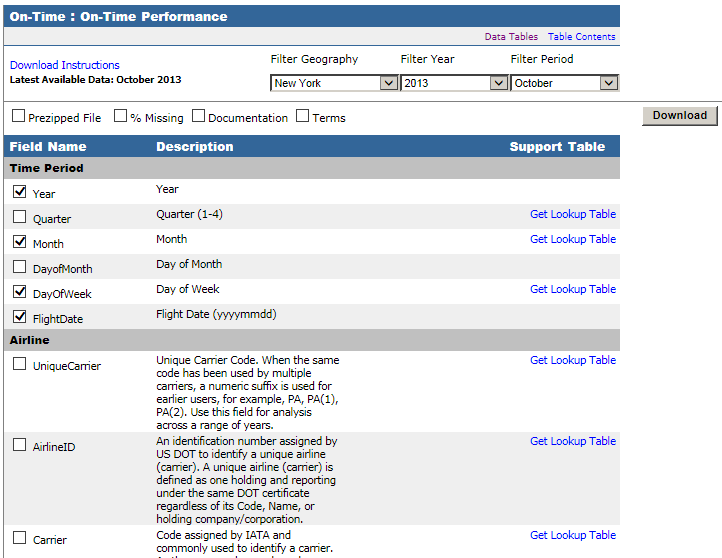 Indeed, if you throw DEST_STATE_ABR in the Report Filter area and filter for NY and leave the ORIGIN_STATE_ABR data in place as per the above shot, you’ll learn that 1,416 of all flights both began and ended in the Empire State (that’s New York). 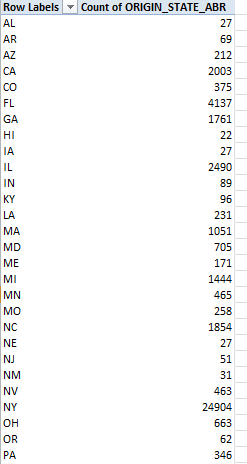 Call me the ingénue, but I’m (perhaps bewilderingly) struck by the near-identical New York arrival-departure numbers for each state as well. Does it follow, after all, that all these comings and goings would necessarily equilibrate? Well, perhaps it does – assuming, for example, every New York-Cincinnati flight need be followed by a return in the opposite direction. It may be that scheduling and maintenance imperatives require all those paired backs and forths. After all, if the plane has to get back to New York, it might as well carry some passengers on the way. In any case, know that even if you confine any additional downloads to just the fields installed above, many more findings nevertheless should slake your curiosity –and even if you’re pleased to study New York data alone. You can, after all, drill back to many years and individual months for New York or any other state. And you don’t even have to latch your seat belt.